Any adhesive for tiles, wainscot, backsplashes, and a range of other top-surface finish materials needs to be cost-effective, strong, and easy to apply. Sag during the curing process is a major concern for vertical applications. Moisture is another consideration. Tile is installed in a range of moisture conditions, from areas that experience high amounts of water to zero-water places. Typical residential places with high and prolonged amounts of water include shower pans, hot tubs, and swimming pools. Areas on the other end of the moisture spectrum include any interior residential space that is not a bathroom or kitchen, wall wainscots, kitchen head-guards, kitchen backsplashes, and bathroom backsplashes. When laying ceramic or porcelain tile, liquid adhesives are necessary for the tile to fulfill all of these conditions and to firmly stick to its substrate. Mastic and thinset mortar are types of adhesives most often used for ceramic, porcelain, and glass tile installations. Both materials can be confusing because of several overlapping applications. Which should you use and where should you use them? Inorganic and composed of materials mined from the earth, thinset is inexpensive and can be purchased either in wet, pre-mixed or dry, powdery form. Additionally, thinset comes in either unmodified or modified versions. Unmodified thinset is composed of Portland cement, sand, and water retention agents. Modified thinset contains the same elements, along with liquid latex polymers to aid with strength and increase the working time. A feature of thinset that is both a plus and a minus is that it is slow to set. This is a plus because it affords a longer working time to fix any misaligned tiles. It can be a minus when working with vertical applications such as bathroom walls and kitchen tile backslashes because this extra curing time also allows the tile to sag. Plastic tile spacers, liberally placed, are the solution for tile sag. Moisture Factor Thinset can be used in very wet areas, even areas that will be completely submerged in water. Mastic can be used in dry or damp areas only. It cannot be used in areas that will be submerged in water, such as swimming pools. 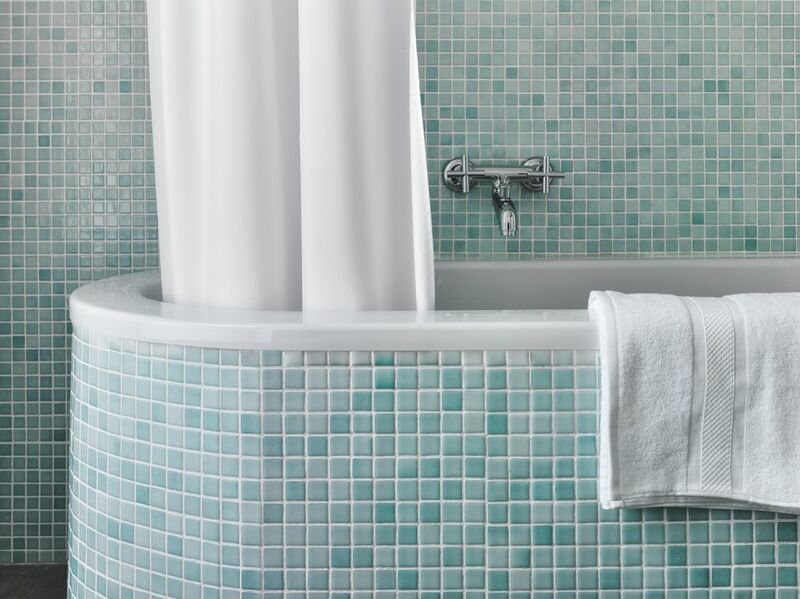 Best Areas Thinset can be used for showers, bathtubs, backsplashes and other areas. Walls, wainscots, dry backsplashes are key areas where tile mastic tends to be used. Pros Thinset is inexpensive and it fills in gaps and depressions. Mastic is very sticky, grabs fast, and is quick setting. Cons Thinset is slow to set, which leads to tile sag on vertical applications. Mastic can give off a sharp, strong odor that takes time to dissipate. Sticks very well, so tile sag on vertical surfaces during curing is minimized. Unused mastic can be saved. When it comes time to demolish the tile, tile mastic makes it relatively easy to remove the tile. Mastic's quick-grab feature means that it is difficult to fix poorly aligned tiles. Mastic cannot be used in high-moisture areas. Mastic has a pronounced odor. Thinset is a stronger material than mastic, making it a better choice for horizontal applications such as flooring that get a lot of pounding. Dry-mix thinset is inexpensive and easy to use. Excess thinset must be thrown out, as it cannot be saved. Thinset takes a long time to dry, and vertically installed tile may begin to droop during the curing process. During demolition, thinset requires considerable labor to remove.